Flagstaff, Arizona 1930. Full-time Astronomer, and part-time sharp dresser Julian Dyson didn’t discover Pluto but he does discover a nasty case of self-righteousness when a former Ziegfeld Girl’s folly threatens his good name. 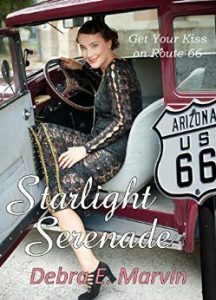 Broadway understudy Clara Longworth and her peculiar younger brother are on their way to a new life in Hollywood when they are stranded along Route 66. Clara is asked to fill in as nightclub entertainment, but her good intentions set her up as accomplice in the blackmailing of a government man who makes the real thugs look classy. Until Julian and Clara put their heads together for more than dancing the Black Bottom, their big-as-the-night-sky dreams are on target to fail. Maybe they need a telescope to see what’s right in front of their starry eyes.